TOMA, Never Discuss Politics at Home, collage, 2017, Santiago, Chile. Courtesy of the artists. Since the new millennium started, the proliferation of protest marches, the occupation of buildings and squares, strikes, and roadblocks became a socio-territorial response to the global violence of neoliberalism. This prevailing ideology enhances amazing levels of development in some privileged places, while at the same time, destroys a broad spectrum of social rights, public goods, communities, and natural landscapes. Both faces, the seductive and the destructive, are necessary; their radicalism will be exacerbated. Meanwhile, architecture is much more involved in the decoration of seductive places than in the dispute against the destructive processes behind them. 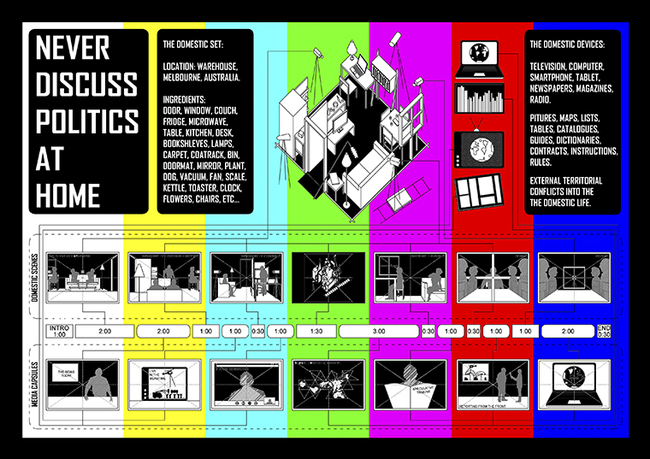 This architectural TV show debates that passivity and challenges our discipline to get involved in the central conflicts of the global agenda through the construction of alternative social and territorial narratives. 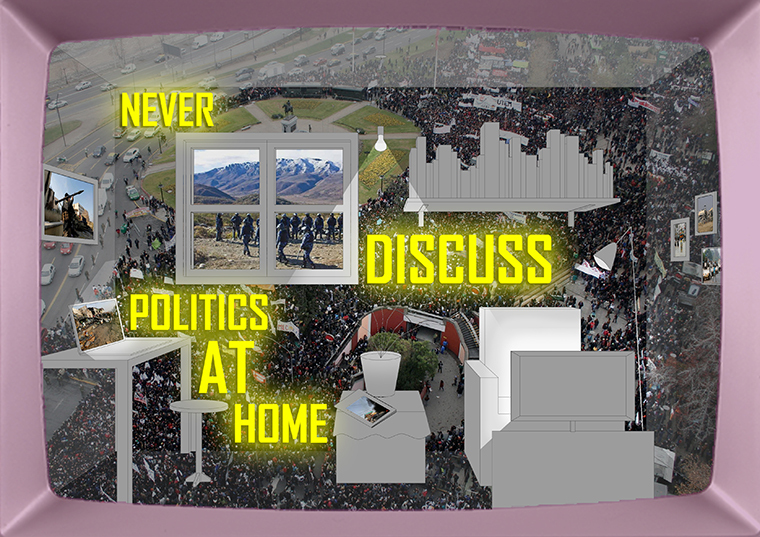 Never Discuss Politics at Home has been developed in collaboration with Eleanor Tullock, Dan Schulz, Bruno Salas, Simón Sepúlveda, and Rafael Guendelman. TOMA is a collective of architects formed in Santiago, Chile at the end of 2012. It develops experimental projects of action and investigation including conflicts between the community and the territory, and links with the current project of neoliberal "progress." 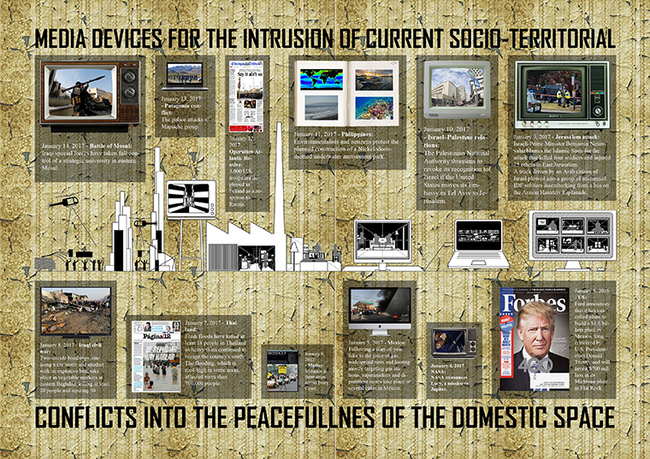 Born in the context of a world in crisis, locally and globally, TOMA directs its practice towards the construction of scenarios critical toward the contemporary neoliberal progressive consensus through projects that combine design and construction work and the development of territorial narratives. TOMA produces facilities, collages, activities, classes, articles, journals, interventions, collections, occupations, magazines, drawings, workshops, films, television programs, plays, chats, sound pieces, files, web pages, and other mechanisms of material and symbolic dispute.